You all know that in a perfect museum everything is at the right place at the right time. Unfortunately, this isn’t a perfect world, hence: no perfect museum. So, part of a registrar’s job is to improvise. Find bug fixes, workarounds and substitutes, use common sense and sometimes parts from your local DIY store. Often, you use your experiences from your everyday life to apply them to you museum work. Just now I discovered that it also works the other way round. Not suitable for all purposes, for the little pimples on them are made from vinyl, but the right ones for carrying around something with a very smooth, slippery surface. In my case, it was the other way round: they should carry something on a slippery floor. I sacrificed two thumbs to have improvised socks I could pull over the bandage. Later I fixed them with some sticking plaster to hold them in place. 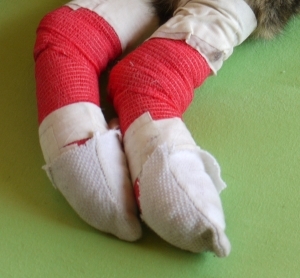 Now, she still isn’t exactly a happy cat, she’s still a little insecure with the bandages (pun intended: she’s all thumbs with her rear legs…) but can walk around without slipping again. My glove supply includes long gold lame gloves, for those artifacts where plain white cotton just won’t do. 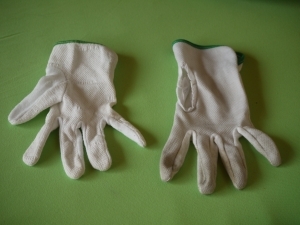 Mi oferta incluye guantes largos guantes de lamé dorado, para esos artefactos donde el algodón común blanco no es suficiente. Great story! And I love the photos. My sister’s cat once fell from a 5th floor window, and we speculate from her almost complete lack of injury that she rode down on the window screen, which was found next to her. ¡Grandiosa historia! Y amo esas fotos. El gato de mi hermana una vez cayó desde un piso 5, y especulamos sobre su casi total falta de lesiones, pues se deslizó encabalgada sobre la pantalla de la ventana que se encontraba a su lado. Thanks, Anne. OMG, I can imagine! Lucky cat! Gracias Anne. Ay, Dios mío, puedo imaginarlo. ¡Pobre gato! Cute! You solved the problem in a unique way. Brilliant. You may be too young for this TV reference, but I call this doing a MacGyver. Or that I am Ms. MacGyver. Brillante. Puede que tú seas demasiado joven para esta referencia de la televisión, pero yo llamo a eso hacerlo a lo MacGyver. O que yo soy la Sra. MacGyver. Terrific idea! Conservators are constantly required to improvise or “play it by ear,” so this was particularly meaningful to me (and I have had my share of dozens of cats over the years). There’s a term used commonly in Guatemala (I don’t know if it is known in the rest of Latin America)- “chapuz.” It is the equivalent of “jerry-rigged” (probably British) and refers to a job done with improvised pr readily available materials and not much know-how. So this concept is well-known, perhaps especially in the third world, where formal education and funds for suitable materials are not abundant. ¡Es una idea fabulosa! Los conservadores están constantemente obligados a improvisar o a “tocar de oído”, por lo que fue especialmente significativa para mí (y mira que yo he tenido mi parte del asunto, con docenas de gatos en los últimos años). Hay un término comúnmente usado en Guatemala (desconozco si existe en el resto de Latinoamérica): “chapuza”. Es el equivalente (probablemente británico) de realizar un trabajo con materiales improvisados y fácilmente disponibles, y sin mucho de “saber-cómo”. Así que este concepto es bien conocido, tal vez especialmente en el tercer mundo, donde la educación formal y los fondos para los materiales adecuados no son abundantes.